Disclosure: This post is part of the blogger program by The Centers for Disease Control and Prevention (CDC) and The Motherhood, who compensated me for my time. Opinions shared here are 100% my own. The flu has hit hard this year. Where I live was especially hard hit. My family got our flu vaccinations (my son got the flu mist) before Christmas, and (*knocks* wood) we have be fortunate to not have gotten the flu (at least yet) this season. We’ve never had the flu before, though. It’s not too late to get your flu vaccination — it still may offer some benefits, since flu season peaks between December and February and can even last into May. It is especially important if you are at risk for serious illness from flu — children younger than 2, pregnant women, adults 65 and older, and people with diabetes, lung disease or other chronic diseases. And make sure to check right away if you exhibit flu-like symptoms. 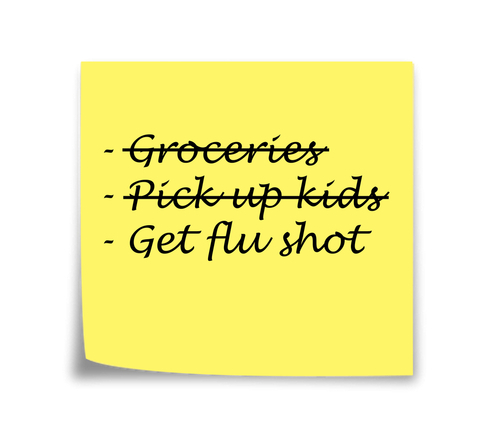 The single best way to keep from getting the flu is to get a flu vaccine (or flu mist). Don’t forget or put off the flu vaccine each year. Flu is serious… not just because it’s painful and something you never want to have to go through, but flu can lead to hospitalization or even worse, death. The flu vaccine protects against three or four different influenza viruses, depending on which vaccine you get (trivalent or quadrivalent). Even when some circulating viruses are different from the vaccine viruses, CDC continues to recommend flu vaccination as it may still offer some protection. While this year’s vaccine may not work as well against the drifted H3N2 viruses, it can still protect many people and prevent flu-related complications. Even getting partial protection is better than no protection in my book. Avoid Close Contact – If you are sick avoid touching others, shaking hands, hugging, etc. And if you know someone is sick keep your distance. Stay Home If Your Sick – Don’t go to work if you’re sick so you don’t spread it to your coworkers and please do not send your children to school if they are sick. Personally, I don’t want my son to get sick or the flu because someone sent their child to school. Cover Your Mouth and Nose – Keep tissues handy and cough and sneeze into a tissue. Wash Your Hands – And wash them often. It doesn’t have to be hot water, either… the important thing is soap and washing them long enough (sing Happy Birthday to yourself twice). If soap and water isn’t handy, use an alcohol-based hand sanitizer. Avoid Touching Your Eyes, Mouth, and Nose – This one is especially important with children, but you’d probably be surprised how many times a day you touch your face. Just be aware of it. Practice Other Good Health Habits – Exercise, drink plenty of water, get enough sleep, keep stress at bay, eat healthy foods, and clean and disinfect frequently touched surfaces at home, work, and/or school. Are you aware of antiviral drugs to treat flu? I wasn’t until recently. So if you unfortunately do get the flu, antiviral drugs can be used to treat flu illness and prevent serious flu complications. Treatment with antivirals works best when begun within 48 hours of getting sick, but can still be beneficial when given later in the course of illness. Treatment with flu antiviral drugs can make flu illness milder and shorter. Treatment with antivirals also can lessen serious flu complications that can result in hospitalization or death. Antiviral drugs are even more important when circulating flu viruses are different from the vaccine viruses, which can mean that the vaccine doesn’t work as well in protecting against infection with those viruses. Be sure to see your doctor if you show flu symptoms and start taking antiviral drugs immediately. Surprisingly, antiviral drugs are under-prescribed for high risk people who get the flu. The above 3 actions will either help protect you from getting the flu or help you to get over the flu quicker with less discomfort. As I mentioned above, don’t put it off… put it on your to do list every year. Remember, if you haven’t received a flu shot yet, it’s not too late! Have you gotten a flu shot this season? Or have you had the flu this season? We have been washing our hands like crazy in our house. I am determined to keep the flu outta here. This year was our first year getting the vaccine. It was required in schools. Thanks for the reminders hun! It’s really amazing how many people will go out into the public when they know they’re sick and contagious. If people would just stay home, we’d all be better off. Yes flu spreads so very rapid in these parts! These are some great tips to stay safe! We always get the flu jab which helps a lot. I don’t agree with taking the flu vaccination at all. This is just a huge biz and the worse remedy ever. Let alone that antiviral are simply useless with flu! Instead you should boost your immune system with lots of Vitaminc C (min 1000mg/aday)antihoxidants and other vitamins and minearals to protect yourself. I have been taking lots of vitamin C for years and never get flu! Great tips! We haven’t got the flu at all this season thankfully. We use lots of hand washing and try to stay away from people with germs if we can! The flu shot is so important, we get ours every year. The other thing we do is wash our hands at least 4 times a day. We didn’t end up getting a flu shot this year with our move. It’s made me very nervous so I yell things like don’t touch your nose and cover your coughs. We are living on the preventive tips right now. Hey its definitely flu season still! I will be honest I am not a fan of flu shot but respect those who do! Yes, I get a yearly flu shot and take all of those precautions during flu season. I hope my son doesn’t have the flu right now. He is sick with a bad cough. We got our flu shots! I have an 18-month old, so I am very vigilant with our shots and working on proper hygiene with the older kids. They still seem to touch everything though! Luckily, we haven’t had the flu… I just got over a nasty sinus infection and we have all had coughs. Part of the whole elementary school thing. Ugh. But, at least not the flu. Everyone should definitely take flu vaccination. It’s not only for themselves but also for others. We dose up on extra vitamin C and really up the amount we wash our hands. A good diet helps too! I’m so glad you post about maintaining health. It’s so important and not a lot of bloggers I’ve come across tend to cover the topic of self-management. Great tips, I’m doing everything I can to avoid getting sick this winter season. Here in Portugal we get it every year! We used to get our flu shots regularly but have been slacking. Fortunately, we’re not that prone to getting it because my daughter is homeschooled and doesn’t bring home those germ nasties from school. I’ve been hit twice with the flu last year. I hope to not get again this year. I have had a few bad colds this season. I get my flu shot every year. I a teacher so I won’t let ,y family go without one!! Apparently it’s not as effective this year but it’s better than nothing. Plus hand sanitizer is my sidekick aLl winter long. Well, I always do #1 and #2, but I’ve never done the 3rd option. If I get the flu this year, I will have to do this important step to keeping myself healthy. Getting sick is the worst, these are all great tips to keep it at bay. Thankfully – also knocking on wood – we haven’t gotten sick here and hopefully it stays that way. From someone who took 2 weeks to recover from the recent flu, I found the post very informational and helpful. I do everything I humanly can to prevent the flu in my house. It’s worked thus far. Knock on wood. Lots of bleach, Lysol, and hand sanitizer in our house as well as whole house sanitizers. I badly punctured my lung and for the next few years and was very suseptible to both pneumonia and the flu. About 10 years ago I started getting the flu shot..and got pneumonia each year. So I stopped for the last few years and had no problem..This year I really should have tried it again..I quickly became ill when the season started. But at least I did not pass it on..I live alone. I haven’t received a flu shot for a few years now since I coincidentally came down with the flu after receiving one. I’ve had the flu twice the past few months (not fun at all! ), therefore I’m considering on getting a flu shot this year! Great advice here to prevent the flu! We never get the flu shot here but I’m all about other preventive measures. I preach the washing hands thing to my kids all the time! I did get my flu shot this season, I got it over at Walmart. Thanks to my insurance it didn’t cost me a thing. I wash my hands all the time,and I try to never touch my face. That helps a lot! We make sure we get flu shots ASAP every year! These are great tips! Great tips. Thanks for sharing them. These are all very easy to follow common sense rules.I can’t stand when people are right next to me and just cough or sneeze and don’t evenbother to cover their face. Thanks for these tips! I am a true believer in hand washing! thank you so much for such awesome tips and my most favorite one is to avoid close contact with the flu person as its easy for the virus to spread and give sickness. 1/6th of my kids’ school was out one day this week! The flu is crazy this year!